Clarke's determination to prevent war puts Bellamy in an impossible position. Kane tries to advise Diyoza. Murphy comes up with a plan to rescue Raven. 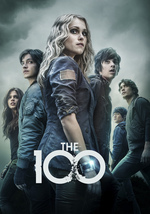 AV Club didn't like it: "You've definitely seen this episode of The 100 before"
Which is true. Because narratively we've seen this back-and-forth of war vs peace and sacrifice a few vs saving all over and over across the show's past seasons. I was coming around to Cooper as an interesting sub-villain, and like most characters there are shades of her that are sympathetic, per her conversation with Monty. Her death was appropriately gruesome for the show, and as I'm about to type out now that it seemed early, I just realized we're already on the 8th episode (of a 13 episode season). Which leads me to the point that this war needs to either happen already or I hope they're actually going down the peace route and the war won't happen. Otherwise this really will feel like a retread of the other seasons. I'm not sure what would make a satisfying conclusion for this season yet given what we've seen, and I don't want to theorize because the characters always have the ability to surprise me. Nevertheless, I want a semblance of peace or progress towards it at the end of this season, which would be a nice change of the bleakness of this show. The conversation of Kane and Diyoza imagining the possible town laying out in front of them was very hopeful. And I really want to see that at least at the beginning of next season (which has already been ordered by CW if you haven't heard). Echo might actually end up killing Shaw at this point, since Raven basically gave her the go-ahead. But that moment between Raven and Shaw makes me hope for better things. Meanwhile, I'm nervous that they might be writing Abby out of this show with this addiction thing. I have no real logic there, just a gut feeling. But it feels like she's heading down a hole of no redemption, especially after shocking Raven like that. Of course Diyoza is not blameless for enabling her, but dictators gonna dictate, like assholes, and I kind of want Kane to usurp her, but then he's not that much better either. I mean, none of these characters really deserve to lead, except maybe Raven and Monty, but that's not in their skillset. Poor sweet Monty though. I wonder what he and Harper means by sitting this one out. Are they going to just stay with the hydrofarm and make the best of it? Narratively it's nice but drama wise it's... boring. Although that Chekhov's algae was great! I applaud Bellamy for ingenuity with using the algae, but now what? How is he going to explain this away? Especially to Miller of all people, who is all in on team Octavia. Perhaps this will give Indra the opportunity to lead? Clarke was absent this episode, and now I wonder if she'll face execution still (I can see Indra reluctantly carry it out just to keep the peace). I know she's got plot armor, but the ricochet from that armor might land on another character we cherish. Madi and Gaia should probably duck. Ahh I forgot to add: I have to think that Diyoza can see right through McCreary's and Murphy's plan. That stare-down between the two of them at the end signals a big challenge coming up, and I really just hope that McCreary eats it at this point. aw dang numaner. i appreciate that you posted for this show. i hope you haven't given up. i finally thought to check and see if there was any fanfare activity about it. not sure what i think of this season. started out so great! but has just sunk into a morass of unlikeable. i pretty much want Clarke, Octavia, Abbey and all McCreary's ilk dead. Maddie is annoying. while i really dig so many major characters being female, i am tired of the white, technically advanced outsiders bringing "reason and leadership" to the natives. time for Indra to have a fuckton more agency than she's been given! anyway. i do think it's possible for the writers to turn the show around and bring this season back to something unique and meaningful, instead of the slog of manufactured conflict.there doesn't always have to be conflict to make things interesting, dammit! especially not when it consists of constant bellicose posturing. it works for a movie, but in a series format... it drags. enough from me. i'll wait and see if you post anything for episode 9.
i'll wait and see if you post anything for episode 9.